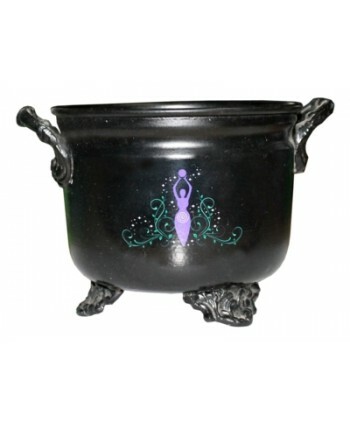 Handcrafted in Wonky Hq Protection/Banish negativity Cauldron CandleThese gorgeous handmade Soy Spell candles are all made in wonky HQ.These magickal spell candles are handcrafted using a specific blend especially for Banishing negativity & Protection.Black in colour with Cade essential oil, dried Sage and topped off with a touch of glitter!! 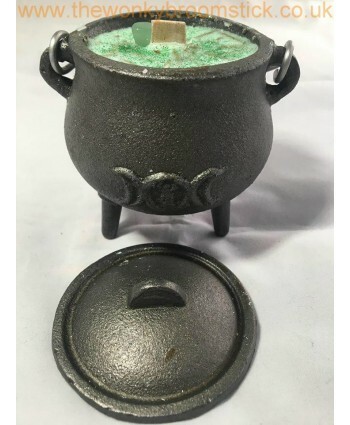 !Complete with wood wick so they crackle as they bur..
Wonky Altar Supplies Metal cauldron featuresGreat for the altarGoddess design on the front Measures approximately 14 x 10 cms ( 5.5 x 4 inches)This lovely metal cauldron features three ornate legs and two matching handles. 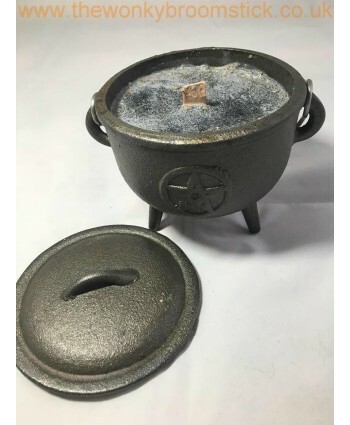 This wonderful cauldron will add flare to any room or altar and is the perfect size for brews incense and smudges.I would suggest adding either sand or dirt into the c..
Handcrafted in Wonky Hq Healing Cauldron CandleThese gorgeous handmade Soy Spell candles are all made in wonky HQ.These magickal spell candles are handcrafted using a specific blend especially for healing.Purple in colour with lavender essential oil, dried lavender and topped off with a touch of glitter!! 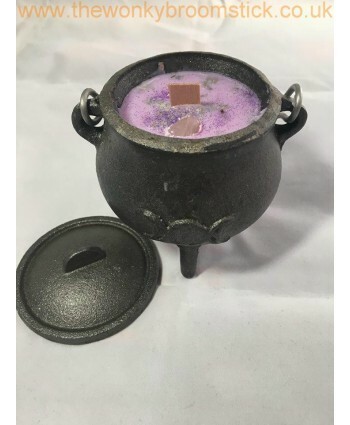 !Candle also comes complete with amethyst crystals.Complete with wood wick so they crackl..
Handcrafted in Wonky Hq Love Cauldron CandleThese gorgeous handmade Soy Spell candles are all made in wonky HQ.These magickal spell candles are handcrafted using a specific blend especially for Love.Pink in colour with Rose essential oil, dried Rose petals and topped off with a touch of glitter!! 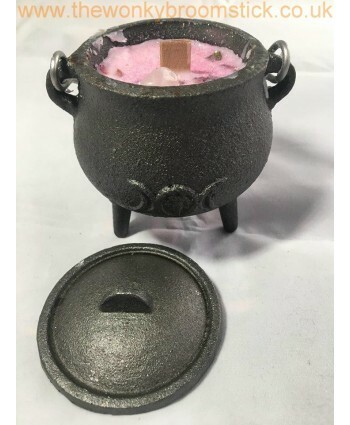 !Candle also comes complete with Rose Quartz crystals.Complete with wood wick so they crackle as t..
Handcrafted in Wonky Hq Luck Cauldron CandleThese gorgeous handmade Soy Spell candles are all made in wonky HQ.These magickal spell candles are handcrafted using a specific blend especially for Luck.Green in colour with Rosemary essential oil, dried Cedar and topped off with a touch of glitter!! 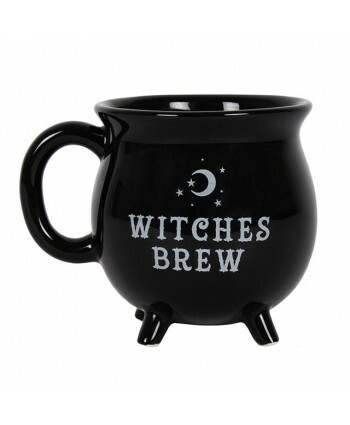 !Candle also comes complete with Green Adventurine crystals.Complete with wood wick so they crackle..